One of the questions I get asked all the time is how I balance my baby’s schedule with two other kids and our busy schedule. This summer has been a busy one for us. We’ve had trips to Las Vegas, San Diego, Palm Springs, New York, Beverly Hills, and this weekend we head to Phoenix. Philip has been traveling for work a lot, we’ve had space camp and swim lessons, we’ve had company several times…all with a brand new baby. 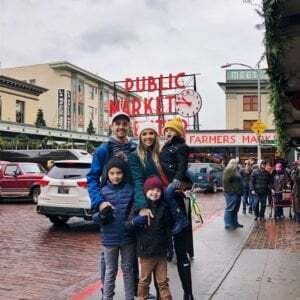 BUT, we love to travel, we love company, I love my job, and our older kids need to be involved in some things outside the home, so we’ve been learning how to make it work without causing stress to ourselves or to San’s little body as it learns and grows. This month is Breast Feeding Awareness Month, so I’m teaming up with Munchkin to share six things we’ve done that are working for us. 1. Have a support system, don’t be afraid to ask for help, and learn to say no. Ok, so this is more like three things in one, but for me these are far and away the most important thing to help me stay sane and balanced amidst a packed schedule. None of the five points below will work as well without these three things. For me, my main support system is my husband. He’s the one that encourages me to go on the work trip to New York City. He’s the one who takes care of the boys (including San) while I leave town for the night. You need someone who pushes you to work hard, but also encourages you to take care of yourself. Lots of people ask “how I do it all.” And the easy answer is that I don’t. The only way that things get done around here is to let other people help. When you’re running on little sleep and the demanding needs of newborns, it’s physically, mentally, and emotionally exhausting. The only way I stay on top of life and work is to ask for help — especially in the first few months after San was born. And people don’t always volunteer to help in the way you specifically need, so ASK or pay someone to help you. My in-laws are both retired, so they’re able to come help with the boys a few times a year, and I have a wonderful babysitter who comes over a few times a week so I can get things done during the day. As soon as San was born, I started paying someone to come clean my house once a month because I just can’t get to it all on my own. I used to iron all of Philip’s shirts, but now I take them all to the dry cleaner cause it’s just one less thing. It takes a village, and it’s okay to ask for help! And most importantly, learn to say NO. You just can’t do everything, so weed out the things that aren’t important. 2. Be flexible, but stick to the schedule as much as possible. Right now San takes two naps a day — a long one in the late morning from about 10:30 until 1:30, and a second shorter one from about 4:00 until 6:00. Whether we’re traveling, in the car running errands, or at home, I try to stick to these nap times as much as possible. Sometimes things need to get done, even during nap time. If we’re running errands, I put a thin, breathable cover (that has a hole in the top) on his carseat so it’s mostly enclosed and if he opens his eyes he doesn’t get distracted, but instead just falls back asleep. If it’s close to his nap time and I know we’re going to have to leave, I always put him to sleep in his carseat and then cover him up so he’s ready to go once it’s time to leave. And if we get home during the middle of his nap, I take his carseat up to his room and let him continue to sleep in there instead of trying to transfer him. I turn the fan and sound machine on, and he usually sleeps for his full nap time. And the reality is, some naps just get cut short. It’s life, and don’t let it ruin your day. Just try again tomorrow. 3. Nap at home as often as you can. No matter how careful we are when we’re out during his nap, there is always something that could wake him up — the slam of a door, one of his brothers talking too loudly in the car, etc. He always, always naps better at home in his own bed. So I try to have him nap at home as often as he can, and try to rearrange my schedule so I can run any errands during his wake time or when my babysitter is here. Also when he naps at home, we use a sound machine turned up pretty loudly, or the fan turned up to the highest speed so it’s loud and keeps the room cool. My boys get constant reminders about “quiet feet” during nap time so they walk quietly past his room or down the stairs and don’t wake him up. 4. Do your nighttime routine always, no matter where you are. Babies thrive on schedules, so this is a really important one. When our days are filled and busy, I always make sure our nighttime routine is the same, with a little one-on-one playtime, a quick bath, into pajamas, breastfeed him, and then swaddle him and put him to bed. Now at five months he totally recognizes the routine and patiently waits to be fed before bedtime. It’s a good way to get out the wiggles, cool him down, and then calm him before bed, and because of it he sleeps really well. Also, if I’m out of town, my husband or babysitter does this exact routine (just with our Munchkin Latch bottle) so San feels calm and safe even if I’m not there. 5. Be patient and stay calm. Breastfeeding is something that can be so calming and relaxing for you and the baby, but can also be completely stressful and super painful. I personally love doing it and am grateful my body produces good milk for my babies. But my husband always says that babies are like animals — they can sense your fear or stress, and they follow suit. I don’t know the biology behind that, but I totally think a calm baby is a result of a calm mama, and if your baby is calm, feeding and scheduling go so much smoother. If you’re struggling with this, don’t worry too much — I was so high strung and stressed after my oldest was born, and now six years and two kids later, it’s so much easier to not get raging mad in the night when you’re being woken up for the fifth time. Or bursting into tears when your breastmilk tips over and spills everywhere. Also, I do a fair amount of breastfeeding in public because we’re out and about a lot. For some people it’s more convenient to pump before they leave the house and then feed the baby a bottle — I’m all for that. But since San is a fast eater, nursing in public isn’t a huge deal for me. I bring a cover with me and either nurse him in the car before we go into a store, or I take the kids to the park and let them play while I sit on the bench and feed him. If you’re stressed out or impatient, the baby will feel that and these out-of-the-house nursing sessions will be chaotic and stressful. Find a calm place, sit down, and relax while you feed your baby. I try to never make it feel like an inconvenience – instead, I think of it as a few minutes to sit and rest during my busy day. 6. Find products that improve your system. On days where I have to leave my baby with a babysitter, or overnight with my husband, the bottle is the biggest lifesaver. It’s the thing that lets me get away when I need to. 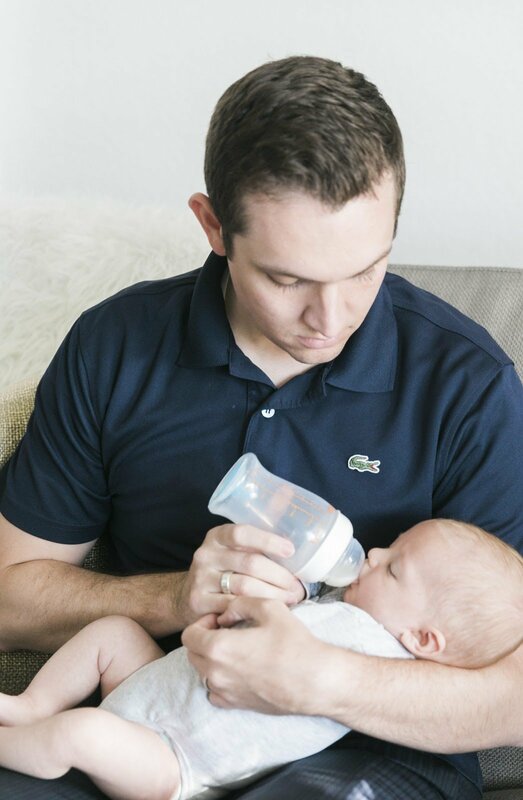 I blogged here about how Fos never took a bottle (even though we tried so many different kinds), so I was thrilled to discover the Munchkin Latch bottle. It’s innovated design and material gives it a shape and material that mimics the breast, so babies are easily able to switch back and forth between breastfeeding and bottle feeding. Seriously, this is a game changer. If you haven’t tried this bottle, you must try it. San really does switch back and forth without a problem, and this allows me some flexibility so we can maintain our schedule while keeping a happy baby. If you have any other specific questions about our schedules, leave them in the comments below! Or I’d love if you’d share anything you do to keep your baby’s on schedule while still living your life.